The Smith Alumnae Quarterly recently launched a fully searchable and downloadable archive of their amazing publications (story). Sylvia Plath featured in a dozen or so from the time she entered Smith through into the 1970s. I have gone through the issues from 1950 through the current Winter 2016 issue and found the following instances either where Plath authored a piece or she was mentioned. I love that the availability of the online archive takes one to the present issue. Fantastic. I was going to take the rest of the year off blogging to give you a break from me, but this resource is too cool not to mention and fits in with a theme highlighted in the Year in Review 2016 of digitization. Fall 1953. Sylvia Plath's "'Smith Review' Revived"
Fall 1954. Sylvia Plath's "The Neilson Professor"
Fall 1956. Sylvia Plath's "B. and K. at the Claridge"
Winter 1958. Sylvia Plath's "Spinster"
Winter 1966. Mentioned: George Steiner's article "Dying is an Art"
Spring 1966. Mentioned: Regarding Lois Ames' biography of Plath asking for letters, photographs and recollections: Where are these now??? April 1972. Mentioned: Margaret Shook's article "Sylvia Plath: The Poet and the College, reprints "Spinster"
February 1977. Mentioned: In alumnae notes about a film project interpreting "Tulips"
August 1977. Mentioned: In article by Patricia L. Skarda: "The Smith Letter: Expressions of Form and Formlessness"
August 1978. Mentioned: In alumnae notes twice; the second time still soliciting for recollections. November 1978. Mentioned: In article. February 1979. 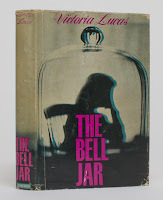 Mentioned: "In the News" regarding The Bell Jar film and in regards to recollections. Most interesting this one. April 1979. Mentioned: In an article "The William Allan Neilson Library"
Summer 1982. Mentioned: In notice for future article regarding Pulitzer Prize and in Judith Kroll's alumnae notes. Fall 1984. Mentioned: In article "Posture Picture On the Wall, Who's the Straightest Of Us All?" Summer 1992. Mentioned: In article "Between Two Worlds"
Summer 1998. Mentioned: In articles, particularly "Primarily Plath"
Spring 2000. Mentioned. In article "Smith Myths"
Winter 2001-2002. Mentioned: In article "Clothes with a past"
Winter 2010-2011. Mentioned: In article "The Poet's Room"
Summer 2016. Mentioned: In article "Voices of Her Ancestors"
This is an amazing resource. Not just for Plath material, but to get an idea of what Smith looked like back in the day, its buildings, students and student life, fashion, the design of the periodical, and the topics that were covered. A real rich history of education, women, and more. I am really grateful for this access to the SAQ archive but that will not stop me from stating my regret that a universal search is not available. I understand there must be limits to what repositories can do. My being gratefully ungrateful notwithstanding: thank you Smith College and all involved in this project. 2016 saw the passing of Ted Hughes' two siblings: Olwyn Hughes in January and Gerald Hughes in August. May they both rest in peace. I would like to issue a very special thank you to R. M. for his very generous monetary gift to me this year. It was the first time anyone has sent me money via PayPal for the work I do on Sylvia Plath and meant so incredibly much. Thank you R.
I always wonder which posts on this blog readers found the most interesting during the course of any year. This year, the Sylvia Plath Info Blog turned 9 which means next year will be the 10th anniversary. Seems hardly possible! But, I would love to know from you, the readers of the blog, which posts in particular you liked the best -- from 2007 to the present. Are there particular areas of focus that you miss from the early days? Or are there things you feel are being ignored outright? Are you tired of the blog? The blog archive is all available so please do click through each month and leave a comment. It might help me to write/research for new content! The Year in Review is always Sylvia Plath from my perspective and experiences and culls through the months to refresh what went on for me. But we have different lenses through which we read, journey, research, and write about Plath, so I apologize if your particular leaning is not a part of the following. I never blogged about these documents or what the British Library did but instead used Twitter to broadcast the availability of them. This is an interesting way to spread news but I find it a lot more difficult to use as a resource than, say, putting things on this blog or over on my website A celebration, this is. It feels more "placed" in the blog. 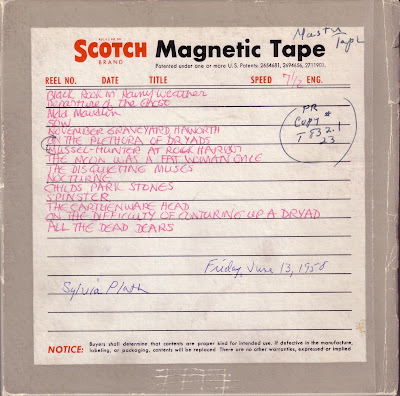 On the concept of digitization, though, this sort of cooperation between Plath's estate and the repositories that hold her archives is a wonderful step forward for Plath scholarship. I hope there will be more of this kind of thing in the future. It should also be stated, of course, that the British Library also digitized many Ted Hughes papers as well. Speaking of digitized materials... Washington University at St. Louis also has a small digital presentation celebrating their "Modern Literature Collection : The First 50 Years". They have a page for Ted Hughes and Sylvia Plath. On the right hand side, scroll down, you will see separate links for Correspondence and Poetry Collections. In the former, there are one letter each from Ted Hughes to Graham Ackroyd and Ian Hamilton; as well as four letters from Sylvia Plath to her late sister-in-law Olwyn Hughes. The poetry collection features "Typescript and autograph drafts with corrections of Adam and the Sacred Nine by Ted Hughes". The exhibit features, also, "May Swenson's recollection of meeting Sylvia Plath at Yaddo in 1959". The other big news story this year dropped in July when Kirsten Dunst and Dakota Fanning announced they will direct and star and produce a new adaptation of Plath's novel The Bell Jar. We can only hope and pray it is a far better attempt than the 1979 version. I have high expectations for this film, as do many of you I am sure. 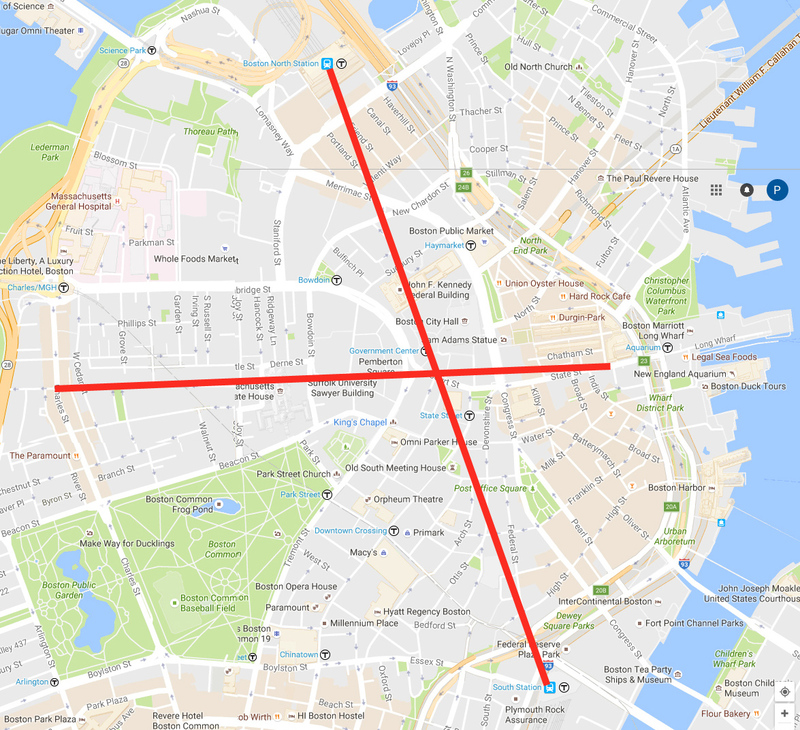 In August I was honored to give Dunst and Fanning, as well as Lizzie Friedman and Brittany Kahan, two of the film's producers, a tour of the Plath sites in the Boston area that are important to the novel. This was truly one of the most amazing experiences in my 22 years of Plathing. I found all four engaging, inquisitive, and very fun to be around. Casting is ongoing and filming is anticipated to begin in the first months of 2017. Archives feature, as usual, on this blog. Get ready for a blitzkrieg of links! 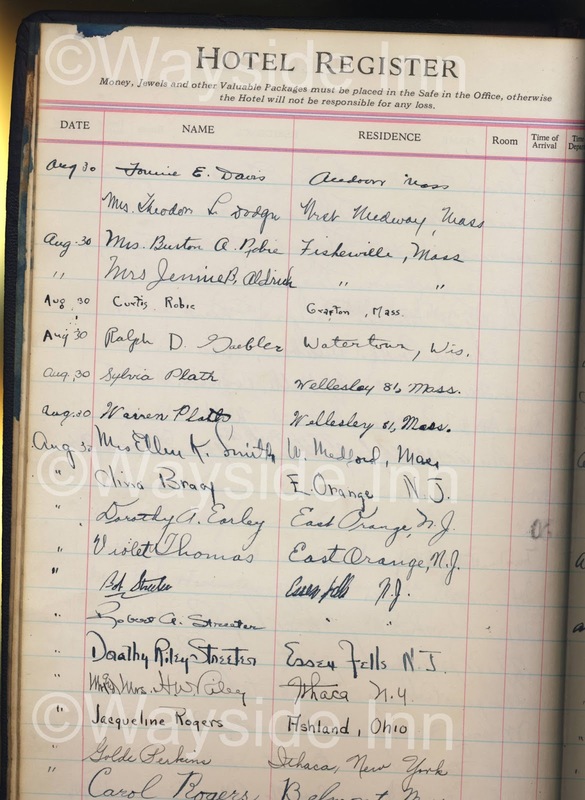 The year started with a post about the guest book Plath signed at the Wayside Inn in Sudbury, Massachusetts. A neat find, for sure. And in October I posted on some of the police records held by the Wellesley Police Department that show the then "live" tracking of Plath's disappearance in August 1953. Puts things into perspective. In February I posted what might be the last on the topic of Plath's work for the Press Board at Smith College. The culmination of six years of off-and-on research yielded 55 articles we can more than likely attribute to Plath based on archival evidence. This added voluminously to our understanding of her extracurricular work while an undergraduate, as well as to her practicing the craft of writing in many different genres. Other archival themed posts involved Plath's work on a Smith College publication, Campus Cat, and Smith's recently acquired Letters to Marion Freeman, which I assisted in them acquiring by befriending Ruth Geissler, Plath's great childhood friend. 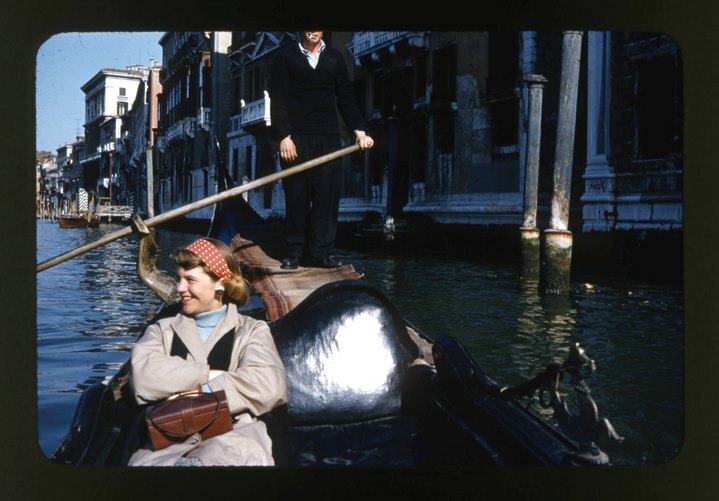 Photographs of Plath in Venice, Italy, held by the Lilly Library were the topic of an April post and I used Google StreetView to approximately place Plath on the Grand Canal where the snaps were taken. In July I highlight all the old copies of The Bradford that Sylvia Plath would have read and many of which she contributed to when she was a high school student from 1947 to 1950. Like the press releases, this post brought to our attention several new Plath publications that were previously not recorded in any bibliography. I broke the posts up into thirds, one for each academic year: 1947-1948; 1948-1949; and 1949-1950. Photographs and movies of 1950s Benidorm were the topic of a post in August – thanks again need to go out to Gail Crowther for finding them. And also in August I made available PDF's or JPG's of all the articles I found on Sylvia Plath's first suicide attempt (website). In fact, after reviewing most of the posts this year, it seems like the gross majority of them are listed here. I know I post far less frequently than I used to, but at the same time I hope that these are of higher quality and content. There were a couple of major auctions this year. Bonhams held sales on 16 March (results) and 15 June (results). Additionally, a rare proof of The Colossus (Heinemann) sold for well above the estimate in a Freeman's auction on 30 September. 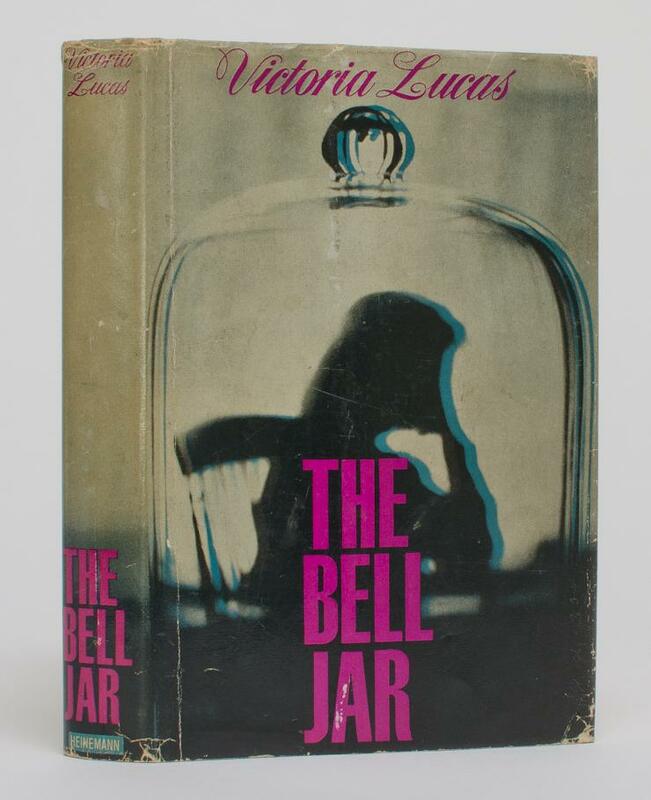 This next sale tickles me… In July I found out about an extra special copy of The Bell Jar (Heinemann, 1963, reprint) and tweeted about it. The book was given by Ted Hughes to Nicholas Hughes, and upon his death Frieda Hughes inherited it. 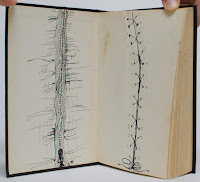 It was damaged, so artist that she is, Frieda drew in clever sketches attempting to metaphorically repair them. That tweet led to the University of Victoria in British Columbia acquiring the copy and I was able to see the book in person in October. As part of their announcing the acquisition and celebrating the special collections 50 year anniversary, I was invited out by Christine Walde and Lara Wilson to give a talk. I wrote a 45 minute talk entitled "'She wants to be everything': Sylvia Plath's The Bell Jar, Letters, and Archives". I gave approximately 15 minutes to each subject in their sold-out basketball gym stadium that seats 2,100. Just kidding. To this day I am still surprised at the turnout, which I wrote about in a post on 1 November. We had a guest post this year from Annika Lindskog (Sweden) of her visit in June to Heptonstall to see Sylvia Plath's grave. Thanks, Annika! As mentioned above, I added PDF's to my main Sylvia Plath website, A celebration, this is, of all the articles I have acquired on Plath's first suicide attempt. That was the only major update to the website this year, but I am working on something additional for the first suicide attempt page and will unleash that on you shortly. From 1 December 2015 to 30 November 2016, the more popular pages on the website were: Biography, Poetry Works, The Bell Jar, Johnny Panic Synopses, and Prose Works. I thought I would also look at a different metric this year and that metric is duration. The pages that visitors to the website spent the most time on are: Biography, Johnny Panic Synopses, The Bell Jar, Publications, and Works Index. Between the website and the blog there were more than 90,000 hits. That's just incredible: Thank you! But there were two books that I was involved in that came to their fulfillment, of sorts. In late May, The Letters of Sylvia Plath was submitted to Faber & Faber. The book has been edited by myself and Karen V. Kukil and we hope to see it out in 2017. We submitted a beast of a book that included all the known letters that we could get our hands on and the manuscript swelled to nearly 3,400 double-spaced pages. This book had been in the works for more years than I can remember so it was wonderful to bring it to completion. I cannot wait for you to read it. At this point in time I am still unable to answer any questions about the book, so please do not ask! 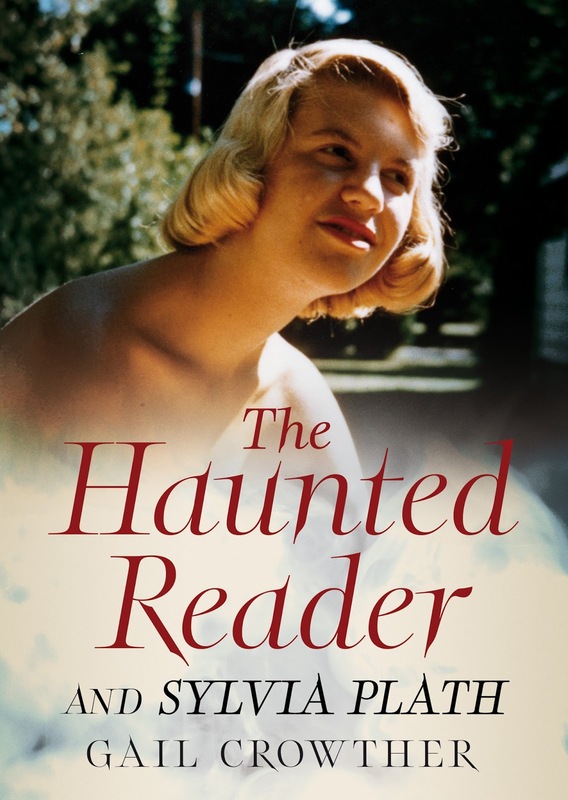 Then in August, on the heels of the Letters book, Gail Crowther and I submitted a book of essays entitled These Ghostly Archives: The Unearthing of Sylvia Plath. We heavily revised our original essays which were published from 2009 to 2013, and wrote much new content detailing our Sylvia Plath archival research. We present a lot of new information. We hope to see this book out in 2017, too. Speaking of 2017: this should be an interesting and busy year. If the Letters are published I would expect this to be big news. Also, look for a long-term exhibit to open at the National Portrait Gallery in Washington, D.C., in June. 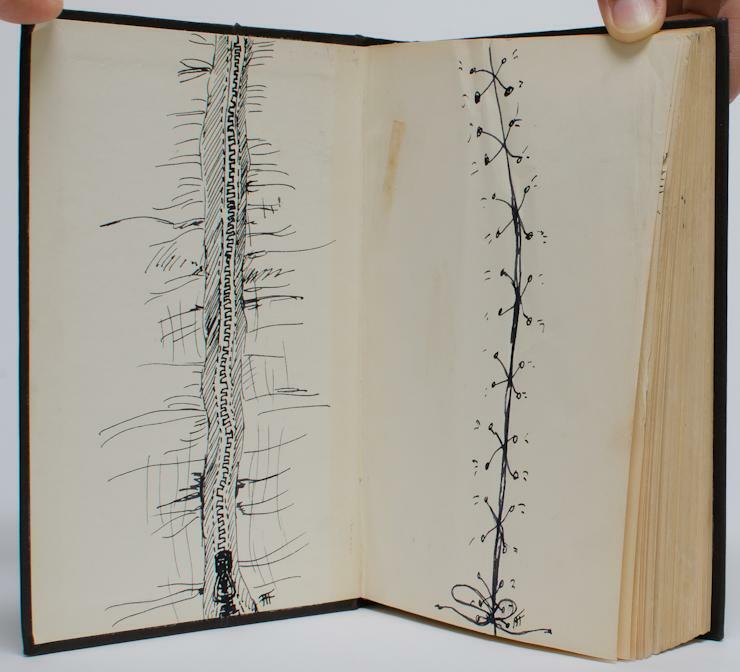 Dorothy Moss and Karen V. Kukil will bring off One Life: Sylvia Plath and will feature many items from the Mortimer Rare Book Room at Smith College, the Lilly Library at Indiana University, Bloomington, Emory University, and private collections. It is going to be amazing. Another, smaller Sylvia Plath exhibit will be on view at the Grolier Club in New York City from 21 September for a month or two. As part of this, Karen V. Kukil, Heather Clark, and I will be panelists on a small symposium at the Grolier in October. More details on these as I learn about them. And, speaking of Heather Clark, she is still hard at work on her literary biography of Sylvia Plath (Knopf). More information on this when I have it, too. Lots to look forward to in 2017, for sure. Thank you all again for reading the blog and for commenting. Thank you to all the librarians and archivists I have bothered ceaselessly this year asking for information, copies, scans, etc. Be safe this holiday season, be happy and healthy, and read Plath. And look forward to the next post on 1 January 2017! All links accessed 18 and 22 October, 15 November, 11-14 December 2016. PS: I see it written a lot, on the internet, that Plath's poem "November Graveyard" was about the cemetery at Heptonstall where she is buried. This information likely has come from Ted Hughes' note in the back of the Collected Poems in which he states that the poem was set in Heptonstall. This may be incorrect. A note in Plath's pocket calendar indicates she began this poem on 9 September 1956. This was three days after a walk to a "green lichengrown graveyard" where she read and "pondered" the old stones. In her pocket calendar, Plath did not an indicate where this graveyard was that she visited. "November Graveyard" was first published in Chequer in the winter of 1956-1957 under the title of ... "November Graveyard". A typescript copy held at Smith indicates she sold it to Mademoiselle in 1958 -- but the poem was not published in that magazine, seemingly, until November 1965! On 18 April 1958, Plath recorded the poem as just "November Graveyard" for Lee Anderson in Springfield, Mass. A short time after this Plath added in the ", Haworth" to the title as when she read the poem for the Woodberry Poetry Room on 13 June 1958, she recited the title as "November Graveyard, Haworth". 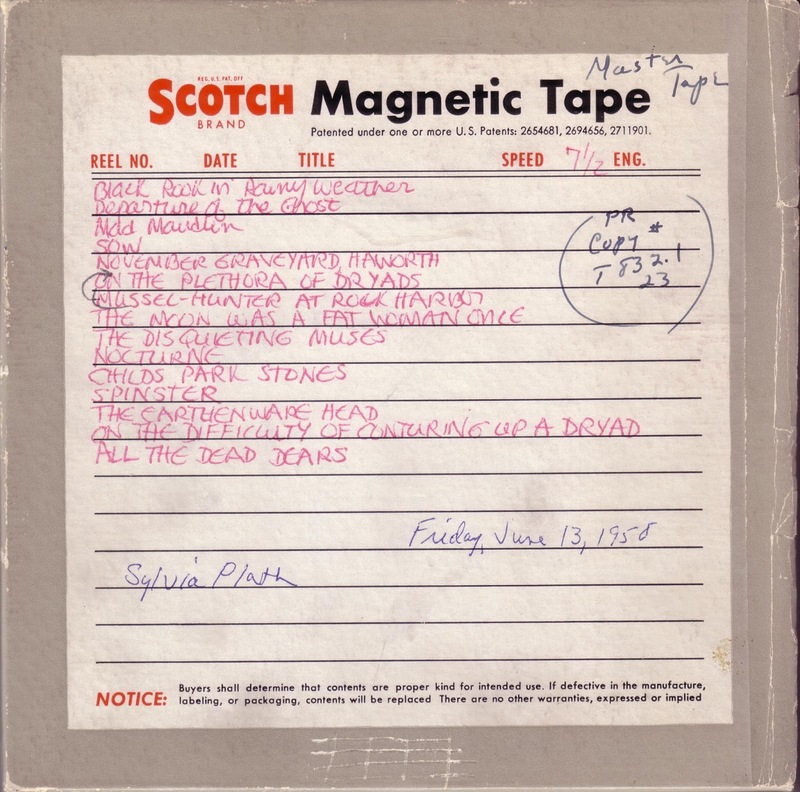 When Plath made her recording at Harvard, she even wrote the titles out on the reel-to-reel case (below), which is held by the Woodberry Poetry Room. "The scene stands stubborn", indeed. 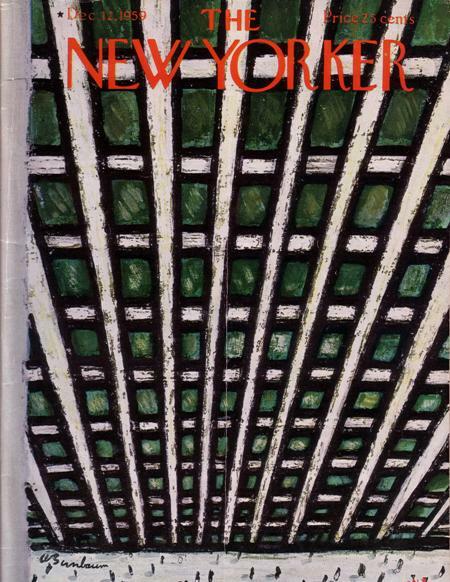 Sylvia Plath's "A Winter's Tale" (the poem) was a New Yorker poem, appearing in their 12 December 1959 issue. 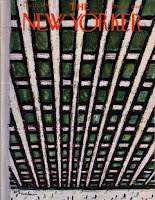 While she marketed it to the magazine in mid-1959, Plath was encouraged by Howard Moss to resubmit it later in the year after revising a line. "A Winter's Tale" is a poem of place, and that place is Boston, Massachusetts. Plath and Ted Hughes had been living in Beacon Hill at 9 Willow Street since September 1958, so she got to experience the Christmas season in the city in 1958 like never before. Plath worked briefly that autumn in the psychiatric ward at the Massachusetts General Hospital, likely in the same building and ward where she was a patient five years earlier in the late summer of 1953. She and Hughes familiarized themselves with their city by foot, often going on long walks along the wharves and through Scollay Square. They also took in museums and galleries and frequented the Boston Public Library at Copley Square. The composition date of "A Winter's Tale" is unknown, but it was certainly after 28 November 1958, when Boston held its Ninth annual tree lighting ceremony, as was reported in the Boston Globe the following day. Joseph A. Keblinsky wrote about it in his 29 November article, "Christmas Festival Opens In Burst of Light, Carols". A read through of his piece contextualizes some of the scenes Plath witnessed. 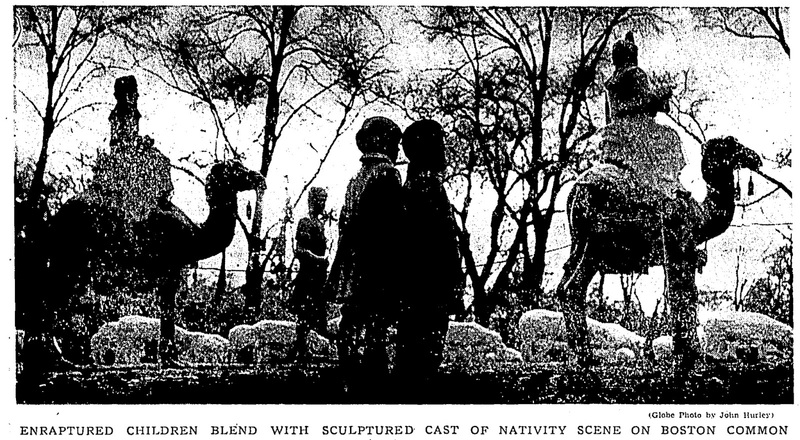 I found, too, a photograph depicting part of the nativity scene printed in the Boston Globe the following year on 30 November 1959. I imagine the scene would largely have been the same from year to year. 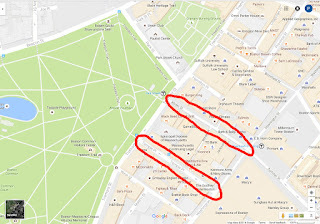 I was reading "A Winter's Tale" recently and was struck by the number of places, buildings, and companies that Plath captured. Some of these sites are still around; some are "long gone darlings", to quote another Plath poem, "All the Dead Dears" (which coincidentally, like "A Winter's Tale" was both the title of a poem title and the title of a short story). Due to copyright, I cannot post the entire poem here, but what I have done is to reference the stanza and then the word or words from the poem which place the verse in Boston. Then I have included a link to a photograph found on Flickr from the 1940s, 1950s, and 1960s, or inserted my own photograph to help to illustrate "A Winter's Tale". 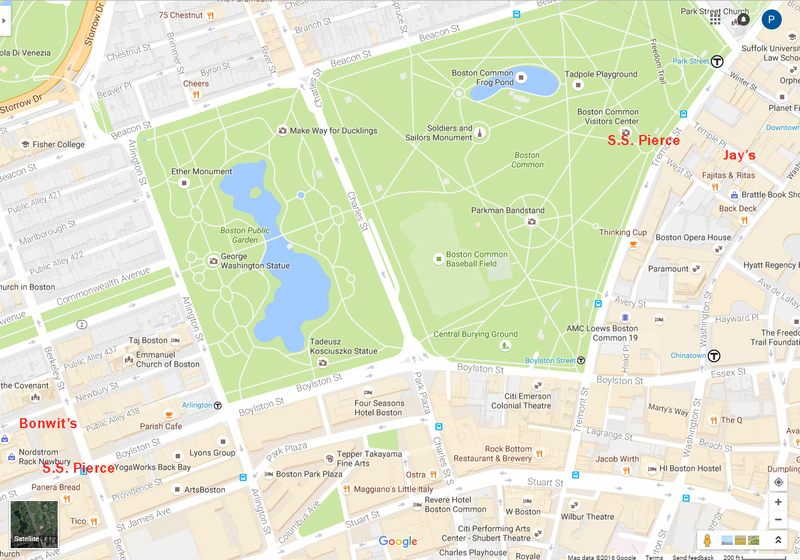 Also there are some annotated Google maps. My hope is that the poem will be visually contextualized in a way that makes it new and modern yet also historically rendered. To set the scene, though, how about a photograph of Acorn Street from April 1958 taken from directly in front of 9 Willow Street. And here, too, is one from February 1959 -- a snowy scene quite possibly taken with Plath and Hughes six floors up in the apartment looking out their windows. In stanza one, Plath begins the poem in her own backyard, as it were, at Boston Common (May 1958). The trees are labeled in the Common and Public Garden; which is something Plath herself referred to in her later poem, "Two Campers in Cloud Country". 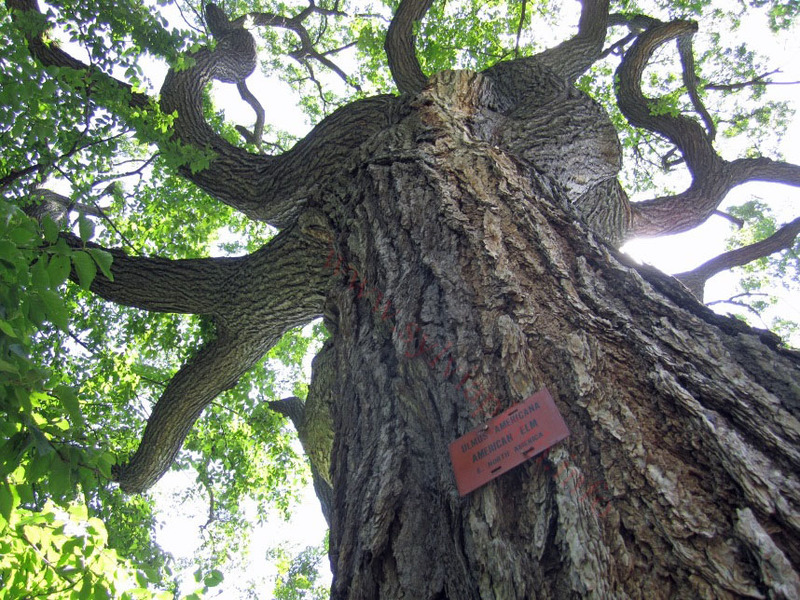 In "A Winter's Tale", Plath specifically mentioned the "Ulmus / Americana", otherwise known as the American Elm. Plath's adolescent home was on Elmwood Road, Wellesley, and she lived on Elm Street twice in Northampton (at Haven House and at 337 Elm Street). The elm likely held particular significance to her. Later, Plath's writing desk in North Tawton was a large plank of elm that was originally cut for a coffin. The desk is now held by Smith College. Peaking Beacon Hill is the "domed State House" (March 1958). 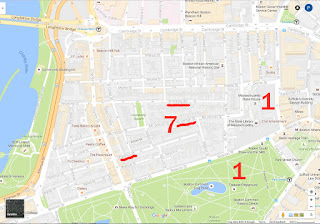 The Common and State house are identified on the map above by the number 1. Here are two photographs. The first is of Boston Common, taken from inside 9 Willow Street in what was Plath and Hughes' bedroom. The second is of the State House, taken from the roof deck. In stanzas three and four, Plath compares the angels in the nativity scene to the models in several of Boston's department stores. She mentions Bonwit's (then at 234 Berkeley Street), Jay's (on Temple Place), and S. S. Pierce (144 Tremont Street). In the image of S. S. Pierce, the building is next to "Central" truck. In stanza five, we are now with the speaker of the poem in Downtown Crossing, then the heart of Boston's pedestrianized shopping area, listening to carolers on Winter Street, Temple Place, and outside of Filene's (February 1959). 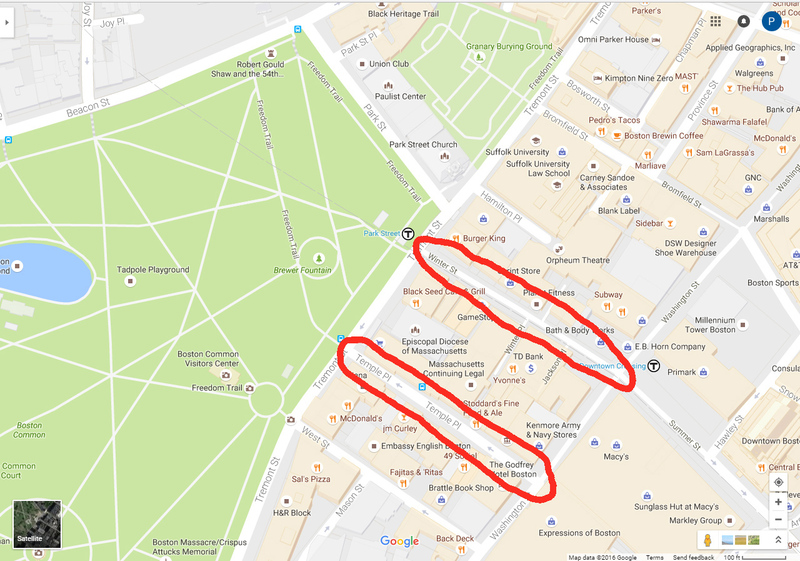 Winter Street and what was then Filene's and Temple Place are circled in the map above. Filene's is now gone, replaced in part by a Primark and an in-construction office and residential tower. 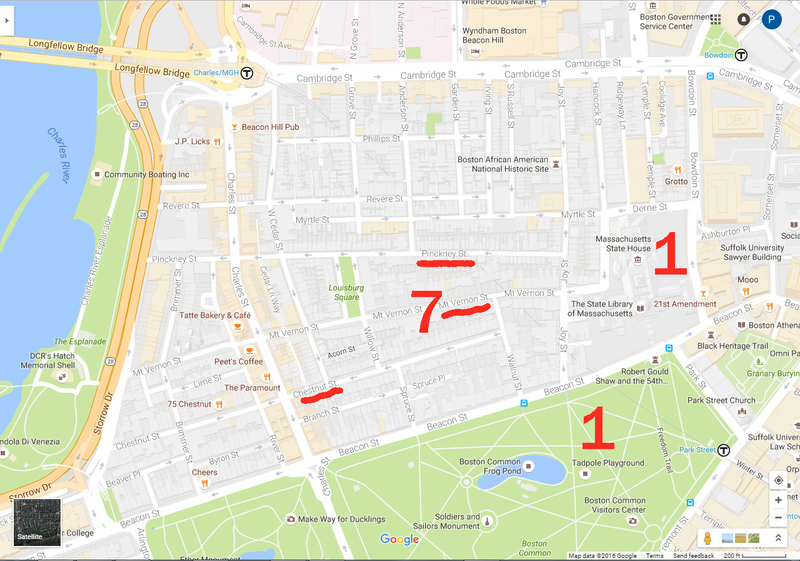 In stanza seven (see first map image above), eight and nine, Plath's speaker is back in Beacon Hill. She name-drops many of its most famous, exclusive streets and listens to the carolers filling the air with their songs. Pinckney Street (March 1959), Mt Vernon Street (April 1958), and Chestnut Street (1958). There are still "odd violet panes" on the windows, too: a fantastic, idiosyncratic detail to record. The image below is from just around the corner from 9 Willow Street. "Of windows with odd violet panes"
29A Chestnut Street, Boston, Mass. Is it the best photograph? Oh, no. Certainly not. But if you are interested in this violet phenomenon, please see "Why Some Boston Brownstones Have Purple Windows", Boston Magazine, 23 September 2015. It is sometimes a wonderful thing to know that my own eyes --and yours too-- can still look upon the very exact same thing that Plath's did. The last stanza and a half addresses the Little City on a hill (See also). There is some interesting imagery here. 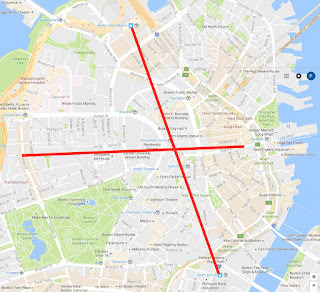 If the the final four place names were looked at from above and lines drawn connecting the points, they would form a close approximation of a Cross, the symbolism for which hardly needs explaining. Charles Street (February 1959) (West) and Customs House (August 1959) (East). North Station (September 1959) (North) and South Station (April 1957) (South). All links accessed 21 May 2016, and 1 and 17 November 2016.